A few tea heads i refer to as drinking buddies and myself drank like fishes for a day. 16 teas in total from 11:30 till closing. After drinking 9 or so Dan Congs, I was quite drunk. Using Roy's friend Thi's words, my consciousness was push out of my body. 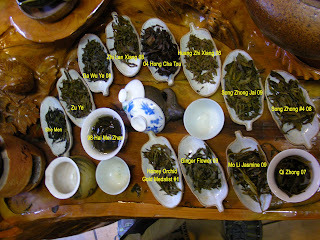 At a subconscious, spirit out of the body period, my palate was able to identify 2 most outstanding teas out of the 16. 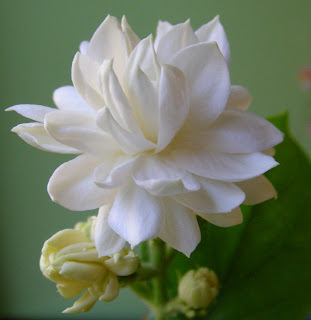 Mo Li Xiang - Jasmine and Jiang Mu Xiang - mother tree of Ginger Flower. I had no recognition of the aroma and taste at that point. But the creamy texture and fullness sets them apart. 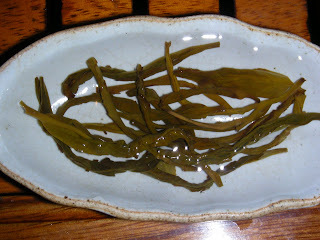 The Mo Li-Jasmine DC leaves are particularly beautiful, even size, nicely rolled with a sheen of shine, very tender leaves of even redness-sign of even fermentation. The aroma is beautiful as well. It's a master piece. I called today intend to hog the rest of the stock, only is too late. All sold out I was told. Oh well, there will be next year, there will be others. A few trees are coming soon tho, I hogged a few trees this time. Plus a reward for my 3 years of hard work, 1/2 a pound of my teacher's private reserve. 2 years ago, one of the nicest Dan Cong I had was Chuan Du Lao Ming Cong, 1 of the top 10 most famous trees of Phoenix Mountain. I had a brew of it again today, the aroma and sweetness sipped through every cells of my body. It reminds me what is excellence among the excellence. Well, this secret private stash of my teacher's is way better than Chuan Du Lao Ming Cong according to him. The tone he used when describing the tea sounded like a lover melting in a lover's arms. That's some serious love shown by a mature Chinese man. In case you are not familiar with Chinese culture, males hardly if ever show their love/feminine sides. I wish they have wings and fly my way this instance! Imen, sounds amazing! I wish I were there. This sounds like something I would have gladly partaken of. I think, however, that drunk is the wrong word to describe the way we feel from the stimulating effects of tea. It is so incredibly wonderful unto itself. I will give my further thoughts at another time. I, too, wish I could have been there.